Edgefinity IoT is an RFID tracking software application that combines RFID technology with real-time tracking capabilities. Edgefinity IoT gives users the ability to track assets, locate inventory, and monitor employees with ease. Edgefinity IoT is real time tracking software for organizations looking to gain real time visibility across large industrial environments. Whether you need to track large amounts of inventory, locate misplaced equipment, or ensure the safety of your employees, Edgefinity IoT lets you quickly deploy advanced, industrial strength real time tracking capabilities. Edgefinity IoT is deployed with state-of-the-art RFID badges, tags, monitors and receivers, both fixed and mobile to deliver up-to-the-second information on any person, vehicle, or asset. 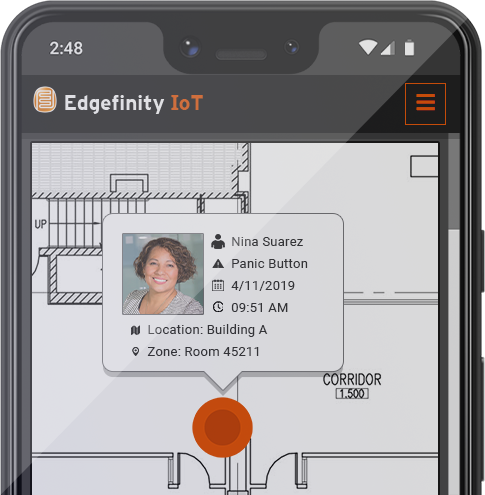 When an incident happens, Edgefinity IoT can automatically set off a set of intelligent reactions such as sending out emails, turning on/off lights, locking doors, call 911, or turn on/off alarms. Build complex rules without writing a single line of code. 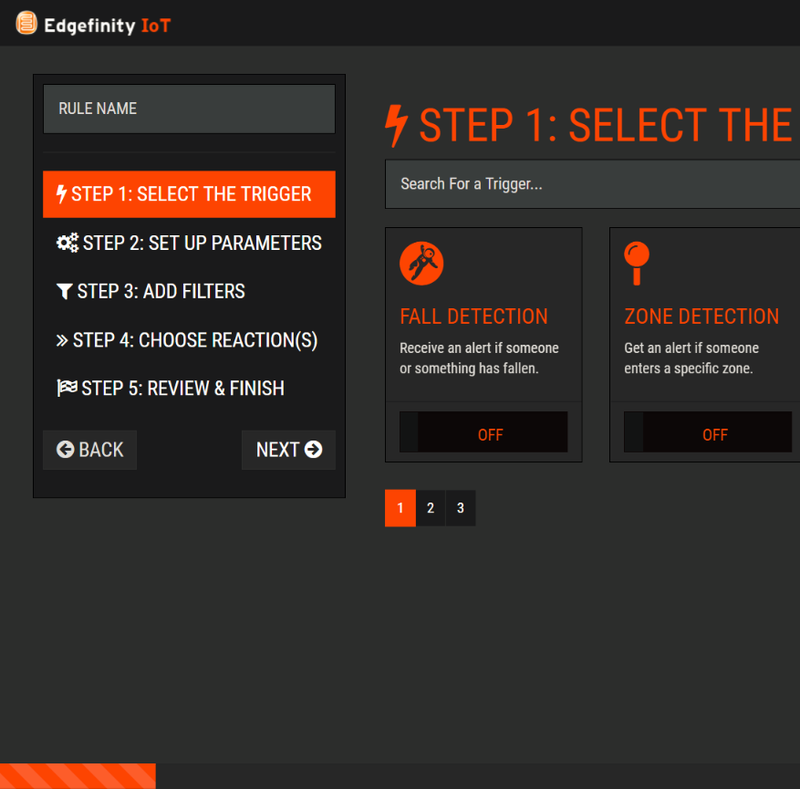 With the Edgefinity IoT rules engine, you can select events, and pair them with the right locations, assets, and people. 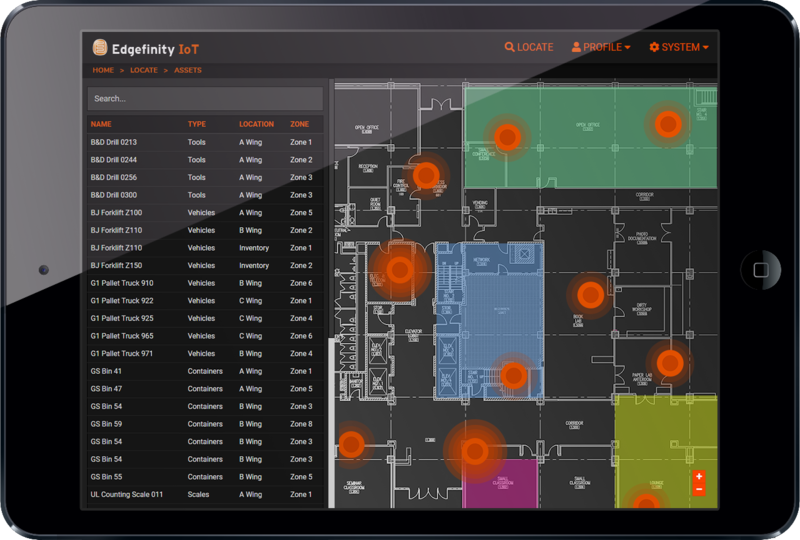 Combining active RFID hardware and software with RTLS (real time location system) and multi-sensor capabilities, Edgefinity IoT keeps you in the know by sending out instant alerts whenever an incident occurs. No matter where managers are, they can always have a live, real-time view of any active alert situation from inception through resolution. Edgefinity IoT is the cutting edge for real-time tracking of inventory, assets, and employees. 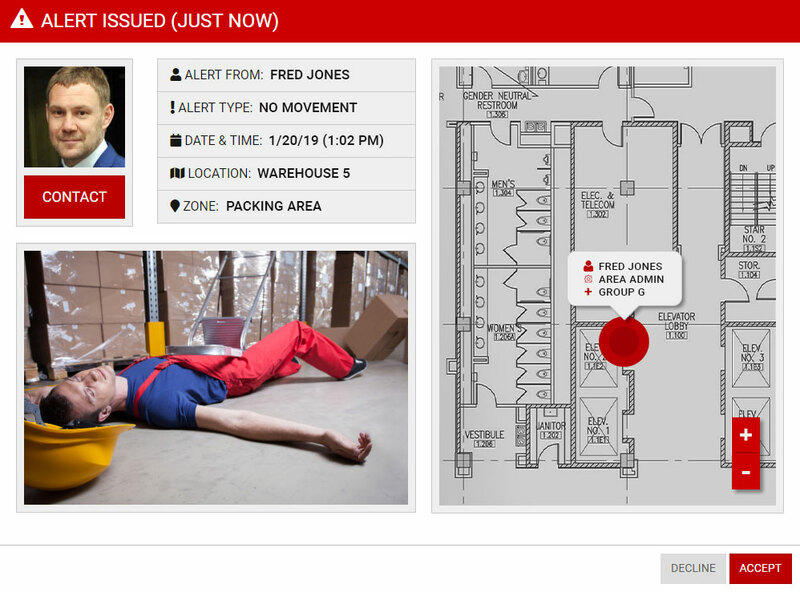 Edgefinity IoT gives you a complete, real-time view of your entire warehouse or retail facility. Whether you need to monitor inventory accuracy, asset tracking or lone worker safety, Edgefinity IoT handles your needs. Keep an eye on your facilities from any device, anywhere. 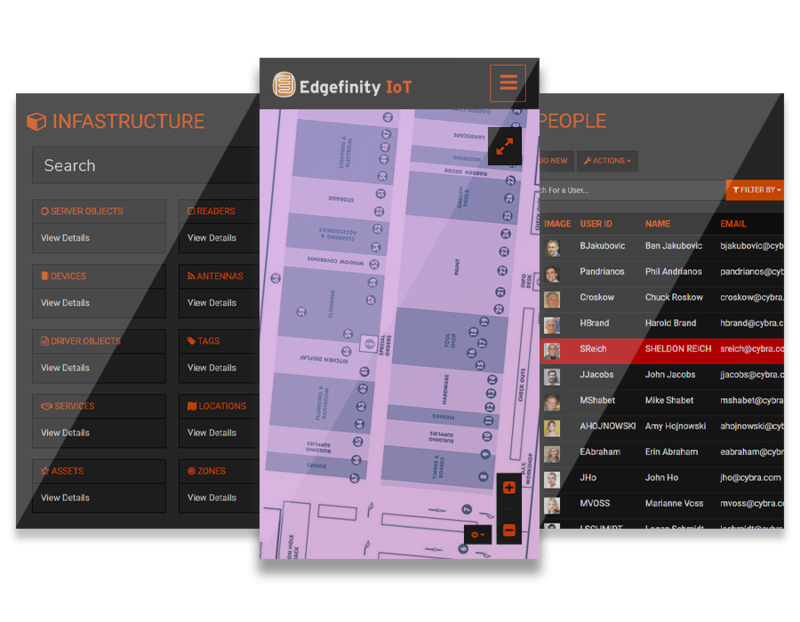 With Edgefinity IoT, you can search and locate any item, asset, or employee in real time. Know when someone signs in or out, where a shipment went, if an asset is being mishandled, or when it’s time to replenish. Edgefinity IoT offers a user friendly interface to find anything in no time. No matter where you are, or where an incident occurs, Edgefinity IoT can send instant alerts if appropriate. Managers have full visibility, as if they are on site. If you have access to a browser, you’ll have an eagle eye view no matter where you are. At the heart of Edgefinity IoT is the Rules Engine. Build complex rules in a few simple steps – rules that range from simple to complex are easy to create. Customize your operation without slowing down your employees or supply chain. When an incident occurs, which meets criteria you select, Edgefinity IoT sends out alerts to the people who need to know to ensure quick, effective action. Alerts can be sent via email, text, SMS, or phone call. Edgefinity IoT can even perform automatic tasks like locking doors, shutting on/off power, turning on/off alarms, and more. Edgefinity IoT alerts can be instantly sent to mobile devices, laptops or desktop computers. Audible and/or visual alarms can be triggered as well. Every single alert is assessed and recorded in Edgefinity IoT. System administrators can identify trends and modify alert rules so false alarms can be lowered, and future incidents can be addressed quickly. Not only is Edgefinity IoT safe – it’s smart. Every alert triggered in your Edgefinity IoT system is recorded as to exactly how and when it was handled as well as it’s final disposition. Managers at all levels can generate custom reports based on any combination of alert types and any other parameters. GET ALERTS. STAY IN THE KNOW. ANYTIME. ANYWHERE. When an accident occurs at your facility, you don’t have a second to waste. Edgefinity keeps your security team organized when an incident occurs. Edgefinity’s RFID & RTLS technology ensures every incident is acted upon, and catalogs every incident for review. Receive alerts via text or email as they happen – right up to the second. 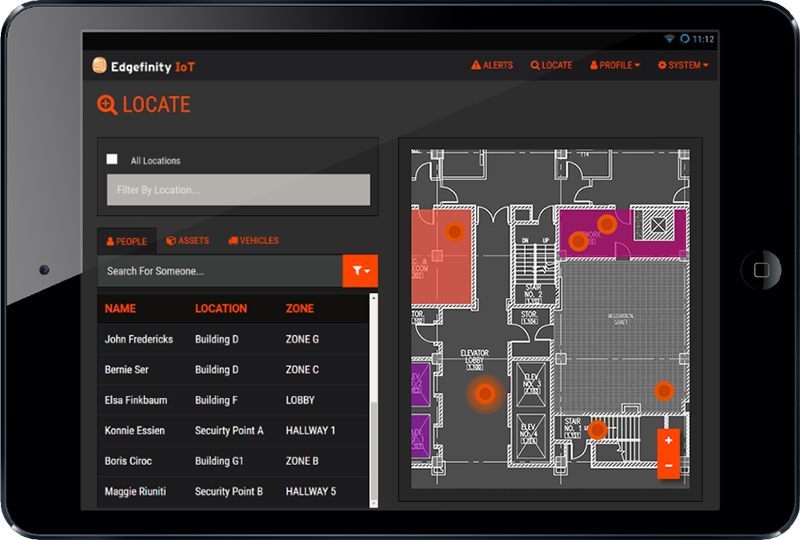 Built on CYBRA’s expert system technology, Edgefinity IoT baseline alerts were developed utilizing the latest in RFID and RTLS (Real Time Tracking Systems) capabilities. Contact an RFID expert today to see how our technology can improve your organizational operations.